'Shakkei' is the Japanese term for the use of ‘borrowed scenery’ or ‘borrowed landscape’ as part of the integral composition of a garden. The term itself was not used in Japan until the nineteenth century, though the idea of using elements of the landscape external to the garden certainly predates this time. It was also widely used in Chinese gardens, and may also be found as a design device in Western gardens too. Capability Brown the renowned 18th English garden designer was familiar with incorporating elements of landscape beyond the garden. 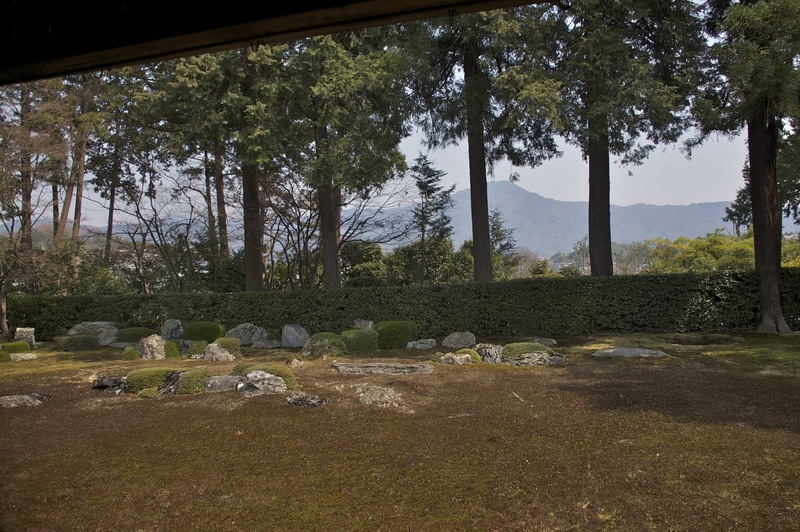 The Japanese garden is composed of a series of subtly structured views. One can appreciate the gardens as being a cross between painting (two dimensional representation) and sculpture (representation in three dimensions). As such a view will require a framing device, for example by means of architectural elements such as frame posts, garden walls, hedges or earth works and so on. The framing device is a way of limiting the borrowed scenery to the desirable elements, thereby concentrating the impact in terms of the composition of the garden. is under threat from the encroachment of the city. 3) with posts and eaves. 5) with garden ornaments, i.e. a stone lantern.